Baby it’s cold outside! But WARM in the studio today here at Mospens Studio!!! RECIPE: 50 custom-made wavy boards, thick buttercream cardstock hand-sparkled with fine glitter, gold thermography printing, hand-tied with straw ribbon, embellished with craft starfish, reply cards and reply envelopes complete with red LOVE postage, tucked in hand-folded gold tissue paper, all wrapped and nestled in natural brown boxes, then each wrapped with a lovely cream satin ribbon, personalized gold raised ink tag attached to the outside of each box. Just gorgeooous! This is our SIGNATURE starfish design. It made its debut in a popular wedding magazine years ago. 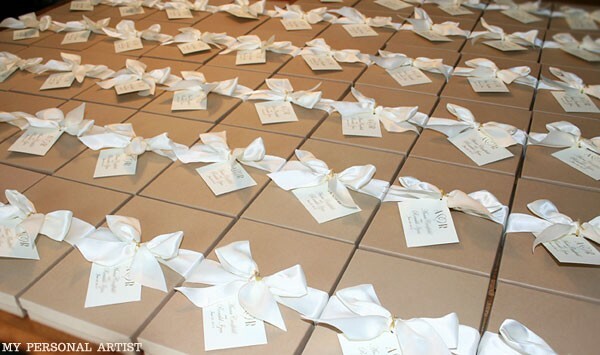 Since then it has been shipped to many creative couples, and mailed to wedding guests all over the world… including A-list celebrities. 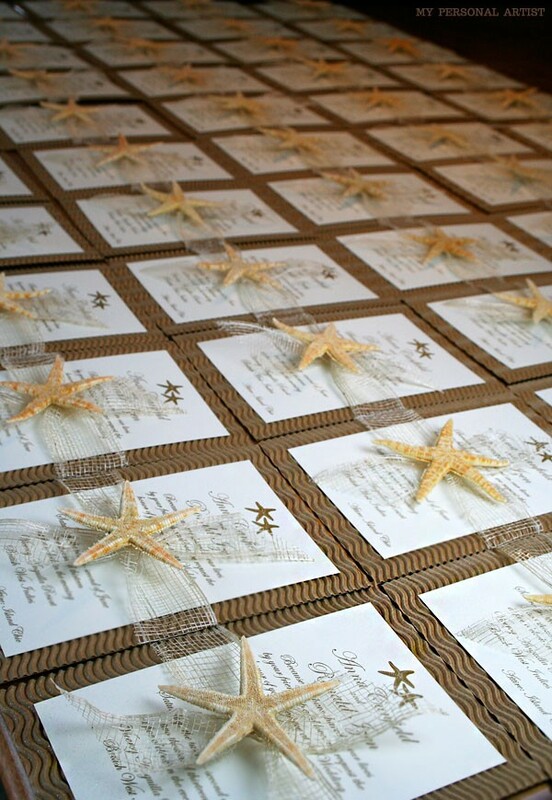 THE CLAUDINE DESIGN also known as Seaside Stars is truly STAR-WORTHY! 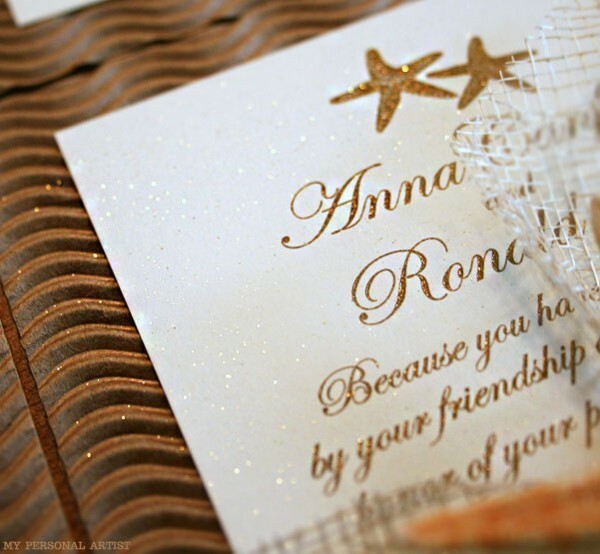 Our SIGNATURE Starfish Invitations wrapped like presents with cream satin ribbon hand-tied into fluffy bows adorned with personalized gold thermography printed tags. 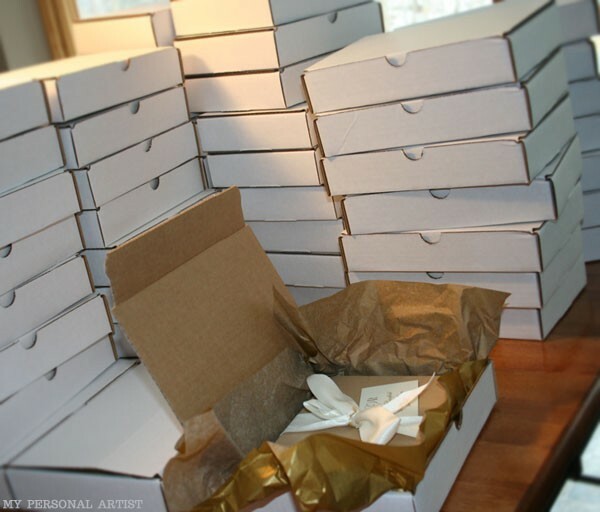 James meticulously boxed up each handmade invitation with gold tissue paper inside of white mailing boxes. Address labels were then adhered to the top of each mailing box for our clients. The custom order left today for NEXT day delivery to Boston, Massachusetts as exactly as requested by our clients. ♥ On to the next gig! 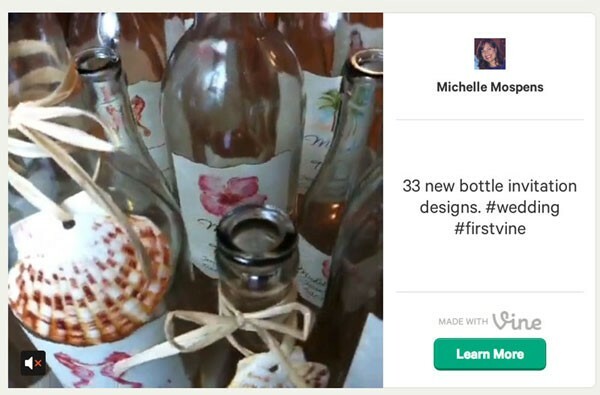 If you haven’t heard, VINE is a new social media app that is AAHMAZING! You can record 6 seconds of video and upload quickly and very easily to your social networks. Look for MANY more videos from our studio Mospens Studio to come!!! Follow me now by downloading the app, go to your profile, click the people icon in the upper right corner and search “Michelle Mospens” … you can then follow me to keep up-to-date on all new videos. Wait until you see my next one, it is fun and creative! I have a confession. … I am addicted to Pinterest!!!!! 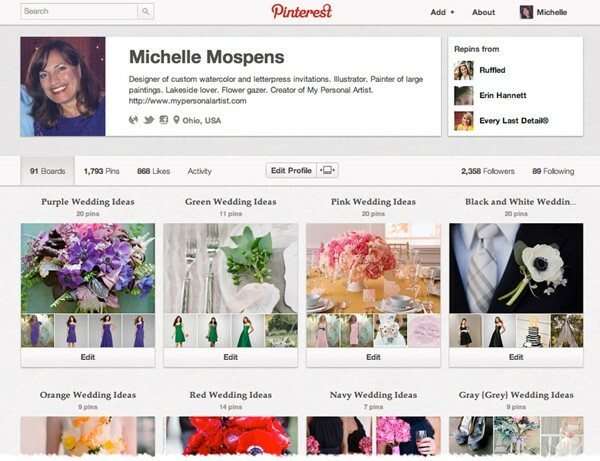 I completely LOVE searching wedding color ideas, wedding themes, wedding cakes, BEST bridesmaid dresses, and more then pinning them on Pinterest to share with brides, grooms, mother-of-brides, bridesmaids, and event planners! I also love how you can find tried and true recipes and save them neatly on your own board. Every dinner, homemade soup, or dessert I have made from my pins are super yummy. It’s like having a best friend sharing their recipes with you. They already made it and loved it! So it feels like and is a no fail. I truly love that about Pinterest. Hand-painted bride and groom artwork is whimsical way to customize your wedding stationery. 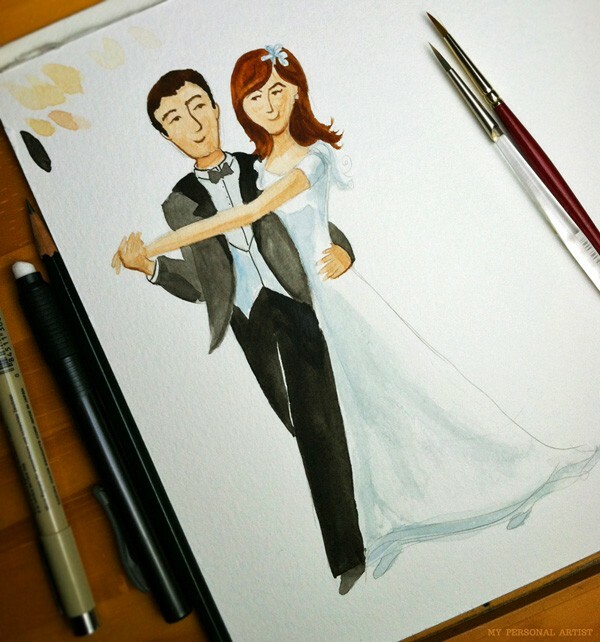 This first artwork was illustrated for our clients’ wedding save the date. I then thought, how adorable to feature a wedding couple on announcements, programs, thank you cards, and other wedding stationery! You can choose skin tone, hair color and style, dress style, tux style, and colors! Even change the color of the brides heels if you want to. 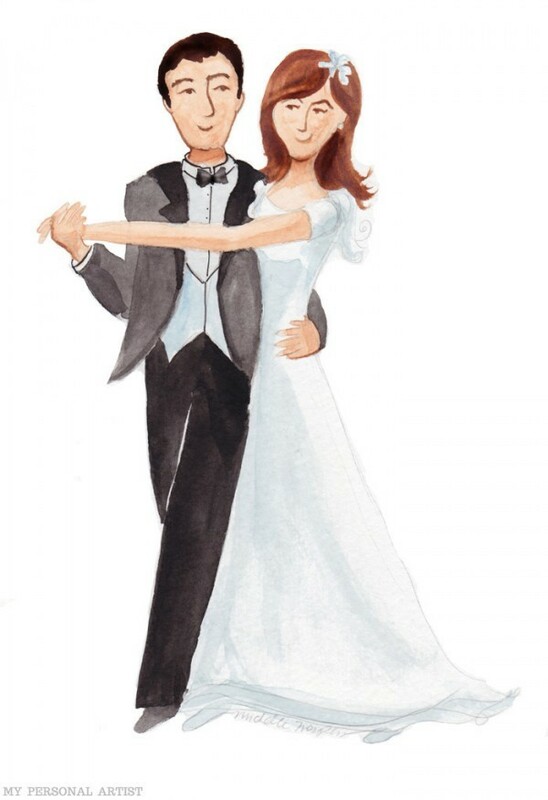 Custom wedding couple illustrations start at $50.00. Stationery additional cost. At this price the artwork is not released for personal use to the client.